A Jack & Jill bathroom is a bathroom that opens onto two separate bedrooms. That is, it is a bathroom that is between two bedrooms and has two doors. 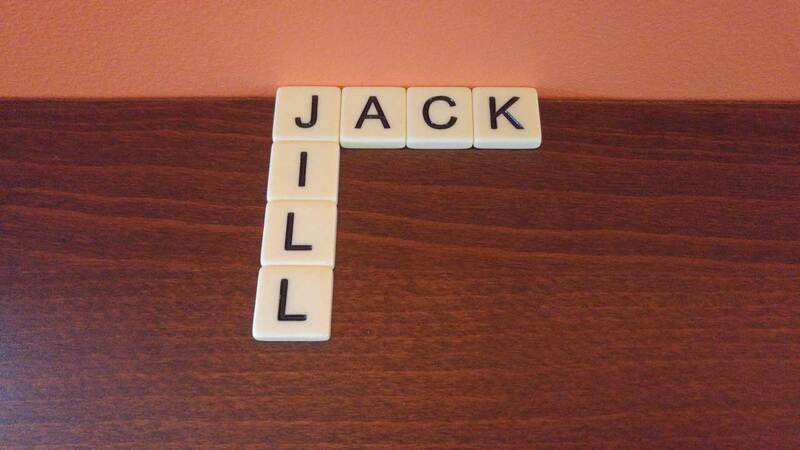 A Jack and Jill bathroom is named after the two kids in the nursery rhyme, but they are typically meant for two siblings who have their own room to share. 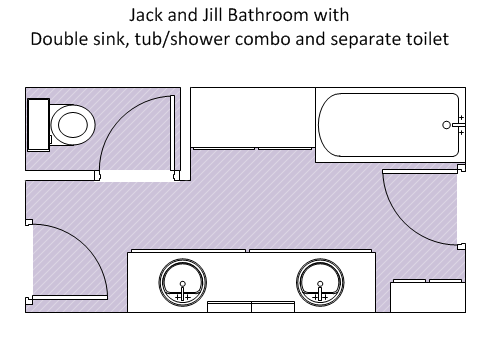 A Jack and Jill bathroom is much like having an ensuite for both bedrooms. Privacy is ensured by having a lock on both doors. Also, there should be a 3-way light switch to allow the lights to be turned on from both entryways. Jack and Jill bathrooms would most commonly be three-piece, four-piece or five-piece bathrooms. If there isn’t much room, a sink, toilet and shower or bathtub is likely going to be the format. If the kids sharing the bathroom are older, a shower would be more useful than a bathtub. Some bathrooms may have a double sink to make getting ready in the morning and evening quicker and more efficient. Having two sinks could reduce the likelihood of arguments over time spent in the bathroom. These kinds of bathrooms differ from the type that has two doors, but one opens onto a hallway, which is fairly common. This would not be considered a Jack and Jill bathroom. They are between bedrooms only. In this above example, the bathroom can be used by two people at the same time. A separate toilet area makes the space much more usable. You couldn’t really fit a two full bathrooms in this space, so this is a reasonable compromise. There is a great convenience in having a Jack and Jill bathroom when two people share a bathroom. Access is perfect for both parties (provided that they don’t want to use the bathroom at the same time) because you don’t have to exit a bedroom, go into a hallway and go into the bathroom. This format can be handy if you want to save space by not having two ensuite bathrooms – one for each bedroom. A Jack and Jill bathroom can also be beneficial if there is no convenient place to have a doorway open onto a hallway. The Edmonton Real Estate Board has no way of officially entering a Jack and Jill bathroom into a listing and it can be hard to tell whether there are two doors into a bathroom to verify that. It might be a case where you’d have to see the real estate listing to know for sure if it is indeed a Jack and Jill Bathroom.